Sometimes all you need is a minute and this can be especially challenging when baby starts to move. 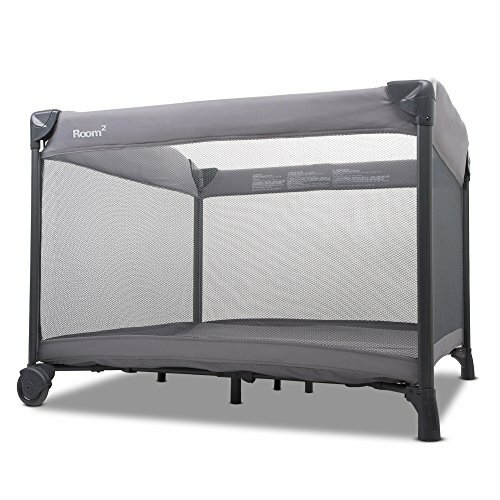 The Room playard provides a safe place while you [fill in the blank]. You'll have peace of mind knowing that baby is safe and secure in the Room playard while you take a shower or use the restroom. With ten square feet of space and new larger mesh windows, the Room Squared gives baby plenty of room to play, sleep and daydream. If you have twins, the Room has ample space for two babies. This practical playard keeps baby up off the floor and in a safe place. The Room Squared sets high standards and has been known as a "workhorse" because it's reliable, durable and built for endurance. Sturdy enough to be used with multiple kids and in playgroups, the Room can withstand the use of growing families. The Room Squared has a low center of gravity and comes with a heavy duty mattress that will support a baby from 0M+ up to 35". A soft, 100% cotton fitted mattress sheet is included and extra sheets are available for purchase. The Room folds in a traditional placard manner. While the Room is bigger and a bit heavier, it comes with a travel bag and is durable enough for trips and overnight stays. We ask you to discontinue use of the Room when your child can climb out. If you have any questions about this product by Joovy, contact us by completing and submitting the form below. If you are looking for a specif part number, please include it with your message.